1. It's new to someone. Dog parks are not a new thing, until it's new to you or new to someone else. Find out how it works. One woman tried to claim an entire caged area for just her and her dog, like signing out a racquetball court. Associations and members constantly arrive into social media and can't quite figure out what it means or how it works. There's a lot to learn. You're going to be surrounded by people who need to learn - no matter how long social media has been around and no matter how many already use it. 2. If your social temperament is bad, consider the impact. 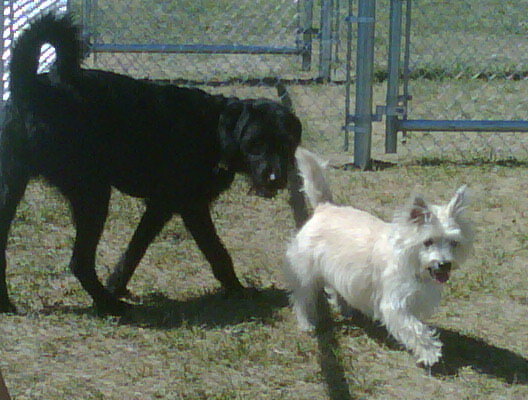 A dog park is a great place to teach socialization, the same way social media can teach socialization. But gee, you bring a dog with a negative temperament into the mix and it actually creates a negative environment that feeds more negativity among the other dogs. What I believe creates the biggest turn-off for many considering adopting social media: they just don't like it when they get there, so they stay away. People have enough conflict in their own associations and in their own businesses without needing more sources for conflict. Last year someone posted a lengthy rant about an association conference; and stated it was in the spirit of caring. That's the same as the owner of the boxer with the bared teeth lunging and growling at my terrier saying, "he really loves other dogs, this is how he expresses it." OK, it's sure not what it looks like it. Intention doesn't trump perception. Those in dog parks and social media need to be mindful that there are playful ways to play and bared teeth/growling ways to play. Start barking and watch the other dogs bark. What if the ones you want to listen can't stand the growling so they will never interact with you? 3. People don't read. What's that 75 pound dog doing in the small dog section? The owner didn't read. Even with one sign directly in front of someone in big letters it's still possible to miss it. With the enormous volume of words in social media a fraction of what any of us put out there is going to actually make it to our audience. If someone has 2,000 friends on Facebook or Twitter the chances they'll see your update actually depends on things as random as if they just happened to tune in around the time you posted it or if they are experienced enough to know how to filter to include you. Where associations were once able to be expressed in media that was exclusively ours (magazines, etc.) - now we're a sentence (status and/or tweet) competing to be read among thousands of other sentences. 4. If you have a problem, address it directly with the owner or make a call. When there's a nuisance dog, the first step is not to take a picture of the dog, the owner, drive home and then call out the owner by name on a blog detailing everything. The dog park sign says it right: if you have a problem, the first step is to talk directly to your "offender" or call the place where it can get corrected. Somewhere along the path in social media people start to consider skipping the steps of professional and personal courtesies. A legend in the association world once said, "just because you can doesn't mean you should." 5. Enter and play at your own risk. Do you increase the opportunity for a legal problem or attack by entering the park - or by doing social media? Absolutely. If I drop my 14 pound terrier in front of a Pit Bull is there more risk than just playing safely in the living room? You absolutely, positively cannot shield yourself or your association to the damage others can cause because you're in the space or anytime you post anything. Does the park give him enriched interactions and relationships - absolutely. You can play wisely - but don't enter without knowing that there is inherently more to watch out for. 7. Just one more type of community. 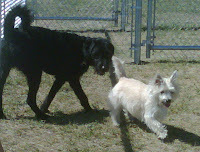 What brings the entire dog park community together is we love our dogs. They may be 12 year old beagles, 4 month old German Shepards, rescue dogs, pure breeds, scared or hyper ... but they've been brought together to experience together. Social media is one more type of community; while dogs instinctively know how to say hello, we might need to be trained. More than ever, many employers and employees are considering the pros and cons of working from home. • Outside interruptions. Working at home often means outside interruptions. Visitors will stop in for coffee, family members may need my help with something … others don’t often think of you as being “at work”. (My favorite thing is the business call I’m on that sounds “less than professional” when the dog starts barking at a squirrel he sees in the backyard.) Be firm with your friends and family from the beginning. Let them know that you are typically on the job during regular office hours. • Conference/meeting space. Not having a large office with a conference room where meetings are held means your files are not readily available at such meetings. I often bring my laptop so I can provide answers to questions regarding budget, bylaws, membership numbers ... Also, keep in mind you’ll have to “pack up” for membership meetings and education events – bringing the banner, flags, gavel, cash bag, handouts, and any other items of interest to the general membership. Make yourself a list of “must-haves” and put everything in one tote that’s ready to go when you need it. When you need space for small events or conferences, call on your affiliates – they are usually more than willing to help out. • Office space. If your home doesn’t have a designated office, you will need to convert an extra room. In my case, my workspace is in the same room as my “home office” – where I pay bills and have my desktop computer and personal files. I have an L-shaped desk, so I try to keep association business on one side and personal business on the other. I have file cabinets, but when those are full, I have to box up files that have to be kept. Trying to find space for those boxes can be a challenge, so plan ahead. A bonus to this inconvenience, however, comes at tax time. Check with your tax accountant about taking a home office deduction of a percentage of your utilities, property taxes, and insurance. • Personal space. An employee who works from home needs to remember that he/she is entitled to personal space. Avoid giving out your physical address. I often get calls from people who want to drop something off. I tell them that we don’t have a physical office and to just put it in the mail that day... sometimes if they’re really persistent I tell them that I have to be somewhere and can meet them nearby. • Separate work and personal time. I’m a salaried employee, so I don’t punch a time clock. My laptop Inbox is open all day every day – including weekends – and it’s very difficult for me to keep business hours. If I see an email where a member needs help with something, I’ll do it at 10:00 at night or on a Sunday morning. And if I take time off, I’m really not good at removing myself completely. If you work at home, you really should strive to separate your work hours and personal hours. Remember, this is your job, not your life. Working at home can be very beneficial – not having to shovel out immediately after a snowstorm so you can get to work, flexibility to make appointments and attend your children’s activities, not spreading germs when you’re coughing and sneezing, but still feel well enough to work – but it’s not for everyone. Be sure to consider all aspects before you make what can be a life-changing decision that affects your entire household. Need a new way to get the class to arrive on time and to return to class promptly after a break or lunch? Try an "on time" prize drawing. At a conference this week, there were "on time" prizes drawn at the start of the day and at the announced time after the breaks. The prize drawings start promptly at the program's start time, and includes 3-4 gift cards. Each member of the host committee has their own organizaiton donate prizes, or solicits gift cards in the $25-$50 range. At the drawing before I spoke were a $25 gift card to Publix, Applebees and Amazon; and $50 in cash. I like personalization, but not forced personalization - where it's clear a name was just inserted electronically from a roster. It has the potential to really highlight how impersonal it is as well. The formal name when you're not called that: Any email that starts "Dear Cynthia," is either from my dad or someone who doesn't know me at all or they'd use Cindy. The address that guesses if you're Ms. or Mrs.: Dear Mrs. Butts. I assume they really meant to reach my mother-in-law. Before you personalize, decide if it's personal. And if you're doing it electronically, consider the potential that if the first part screws up what impact the rest of the email might have.